What can be more important to your organization than business continuity - when even a single hour of downtime can cost a company as much as $300,000 or more? 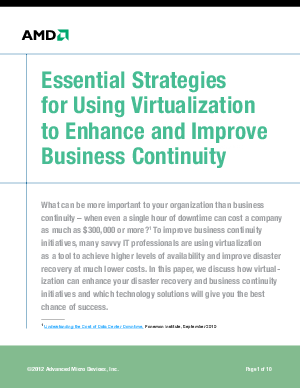 To improve business continuity initiatives, many savvy IT professionals are using virtualization as a tool to achieve higher levels of availability and improve disaster recovery at much lower costs. In this paper, we discuss how virtualization can enhance your disaster recovery and business continuity initiatives and which technology solutions will give you the best chance of success.